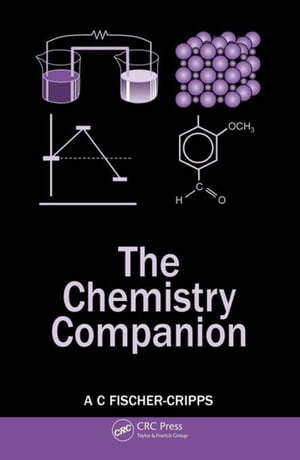 Collins Booksellers - The Chemistry Companion by Fischer-Cripps, Anthony C., 9781439830895. Buy this book online. Like the author's other companion books, The Chemistry Companion provides-high quality information in unique one-page-per-topic presentations that do not overburden and distract with excessive details. The book offers concise summaries of general chemistry concepts, easily accessible in a convenient, reader-friendly format. Suitable as an introduction or study guide, this companion presents the minimum of what readers need to know to understand the subject. It emphasizes the physics underlying chemistry. By looking at chemistry processes from a physics point of view, readers can better appreciate what is happening from the chemical perspective that is usually found in traditional chemistry books. The author focuses on the structure of matter, chemical components and bonds, the periodic table, states of matter, thermodynamics, reaction rates, carbon chemistry, biochemistry, and chemical, ionic, and electronic equilibria. Each topic is covered in a single-page outline format with just enough detail to enable a good understanding of the subject.